We gained an hour as Portugal is the same as the UK so we awoke refreshed before 0800 local time. The temperature has suddenly rocketed here with 35 degrees in the shade and over 40 in the cockpit. 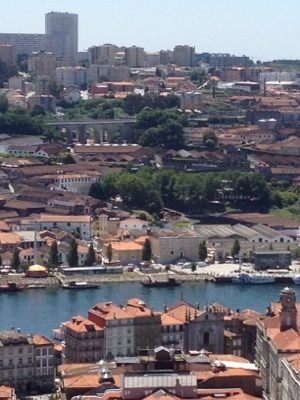 We had already decided that we would visit Oporto so we caught the metro – €7 each return for a 40 min journey. Neither of us had been to the city before so didn’t know quite what to expect although we were keen to sample the port! The city is stunning. It has a long heritage and was clearly wealthy in its heyday with a large number of very grand buildings around a maze of streets. It is also very hilly so everything seems to be up a hill! To start our visit we went to the Torre dos Clerigos and climbed to the top to get a wonderful view of the city and get our bearings. 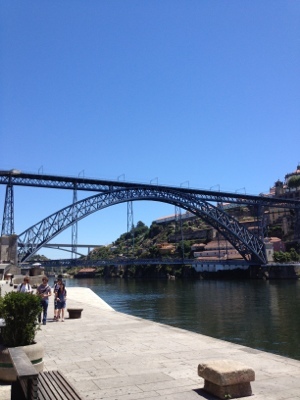 We then walked down to the river Douro which is filled with cafes and bars. 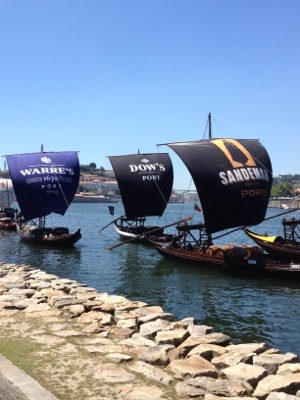 The river was the principal transport for the export of port from the vineyards further east to the boats at Oporto. To cross the river, you walk across the Dom Luis bridge and then you can go to the various port cellars to sample their wares. Apparently, there are now 48 brands of port but we limited ourselves to just 5! The first was Taylor’s which is the only family run business left that has never been taken over. 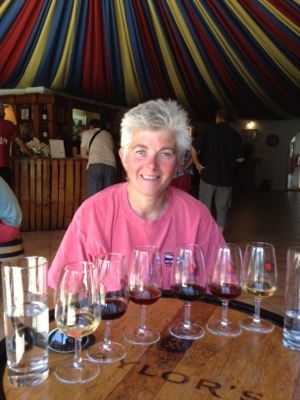 Liz was keen to have as many tastings as possible as you could get three glasses of different port for €3. Suffice to say, she slept well on the train home! I’m very jealous of your port tastings. Jerez & Oporto are high up my list of places to visit.